single mom: life, love, the pursuit of happiness. : dental.pain. things happen. sometimes we don't expect it. i'm a planner. i love my to do list. i like knowing what comes next. so you can imagine my surprise when my suppose-to-be 30 minute endodontist appointment lasted from 7:45am to 11:07am. yes, friends. i was awake at 7am this morning. this never happens. i thought "oh i don't have to work until noon. i'll have plenty of time to take a nap." WRONG. i had leave immediately from my appointment to go to work. i was not a happy camper. the appointment was to complete a root canal from may. yes, may. i had some issues with infection in my bone so the best route was to implant some antibiotics to clear out all of the bacteria. i thought getting the temporary out and placing the permanent was all to expect. i didn't KNOW they hadn't even TAKEN OUT the roots yet. O.M.G. pain pain. not to mention my awesome pre-existing lockjaw. holy crap. i was about to come unglued. i think the dr knew this. he mentioned being so sorry the appointment was taking forever. of course, i'm rachael so my roots were loooong and curvy. hence the reason for such a long time period. so. he gave me an ice pack for my poor, poor jaw. i really didn't know if i'd make it the day at work. but i managed. ibuprofen and i are bffllsssss. but really, i'm ok now. sad face. i was in so much pain. this is in the parking lot before going inside to work. 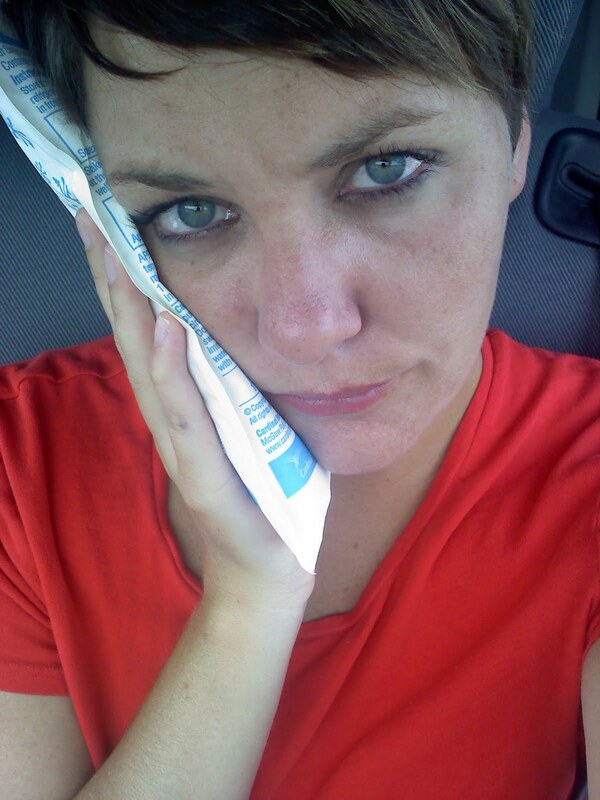 can i just say.. even though i'm complaining..
i'm very thankful to have dental insurance! now.. back to watching the national league kill the american league!